Caustics are common in household and industrial products, and, when ingested, they can pose a significant public health risk. Caustic exposures in adults typically present in the setting of occupational exposure or suicide attempt; exposures in children occur most often by unintentional ingestion. Caustics cause local damage upon contact with tissue surfaces and can lead to systemic toxicity. Endoscopy is recommended in all intentional ingestions (and many unintentional ingestions) to grade injury severity, determine treatment options, and assess prognosis; however, it is generally best performed within 24 hours post ingestion to avoid risk of perforation. Radiography and computed tomography may also be used to visualize injury in certain cases. 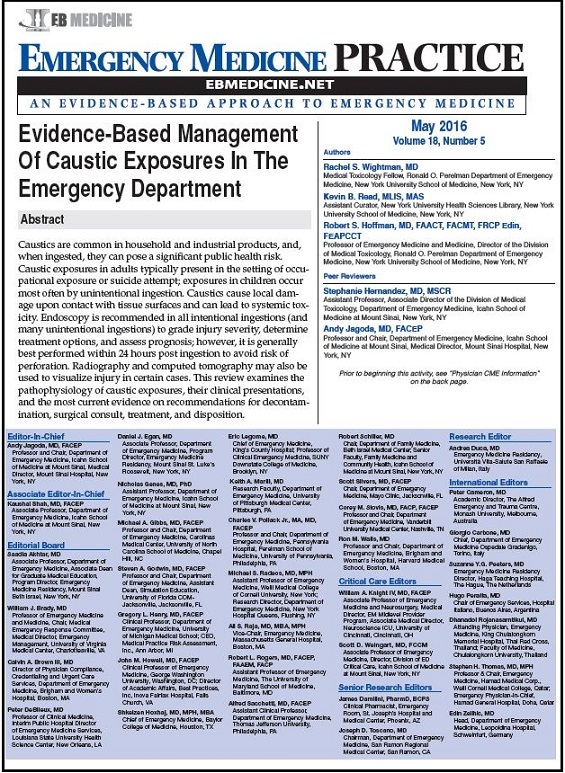 This review examines the pathophysiology of caustic exposures, their clinical presentations, and the most current evidence on recommendations for decontamination, surgical consult, treatment, and disposition. A caustic or corrosive is a xenobiotic that causes damage to tissue surfaces upon contact. Caustics are routinely found in household and industrial products as well as cosmetics and personal care items. According to the 2013 Annual Report of the American Association of Poison Control Centers Toxic Exposure Surveillance System, 91% of all toxic exposures occur in the home.1 A list of common caustics and their uses is presented in Table 1. Caustic exposures can occur via dermal, ocular, inhalation, and oral routes. Ingestion is the main cause of long-term morbidity and mortality. Injuries from caustic ingestion can range from mild gastrointestinal irritation and ulceration to life-threatening necrosis, perforation, and/or systemic toxicity. Caustic ingestions follow a bimodal pattern, with peak occurrences in the pediatric population aged 1 to 5 years and then again later in adulthood.2 Eighty percent of reported caustic injuries occur in children, most often via unintentional exposure to household products, with the greatest incidence around 2 years of age.3,4 Adults may be exposed to household or industrial products as a result of an occupational accident or a suicide attempt.5 In children, 18% to 46% of all caustic ingestions are associated with esophageal burns. This percentage is likely higher in adults, who typically have more-severe injuries due to the greater volume of exposure when a caustic is consumed with suicidal intent versus unintentional ingestion.6,7Caustic exposures have been a public health concern throughout history. Legislative changes, such as the mandating of child-resistant packaging and mandatory concentration reductions for household chemicals, in addition to public education campaigns for safer storage practices, have been employed to prevent poisonings. However, despite these efforts, caustic exposures still occur. In the United States, it is estimated that more than 200,000 exposures to household or industrial cleaning products and 5000 to 15,000 caustic ingestions occur annually.7-9Fortunately, serious caustic exposures are uncommon events, but the emergency clinician must be able to recognize this potentially life-threatening entity and initiate proper therapies expediently. 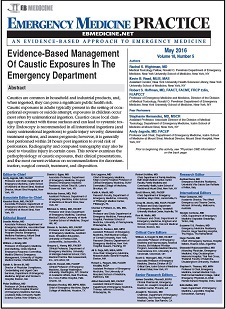 In this issue of Emergency Medicine Practice, we review basic pathophysiology and provide best-practice management recommendations for patients with caustic exposures.